U.S. EPA Tier 4 Final and EU Stage V models save maintenance costs by extending engine oil, engine oil filter and hydraulic oil filter change intervals from 500 hours up to 1,000 hours. The Cat Advanced Productivity application is a web-based tool used to visualize machine production-related data and complements Cat PAYLOAD, Cat Production Measurement 2.0. The tool is accessed from VisionLink and includes a user-customizable report dashboard, cycle-by-cycle downloadable data, and a list of features for truck and material identification lists. Other key features include a new user interface (mobile friendly), time series data, multiple asset comparison, fleet or individual asset key-process-indicator target settings, and support for multiple machine types. Requirements for use include cellular Product Link, Advanced Productivity subscription, and authorized User ID. Remote flash support allows the dealer to push software update files to the customer's machine and authorizes the user to initiate installation via the dealer service portal. Any authorized user with CWS (Caterpillar Corporate Web Security ID) and a mobile device can initiate flash, which occurs in 30 minutes from initiation to completion. 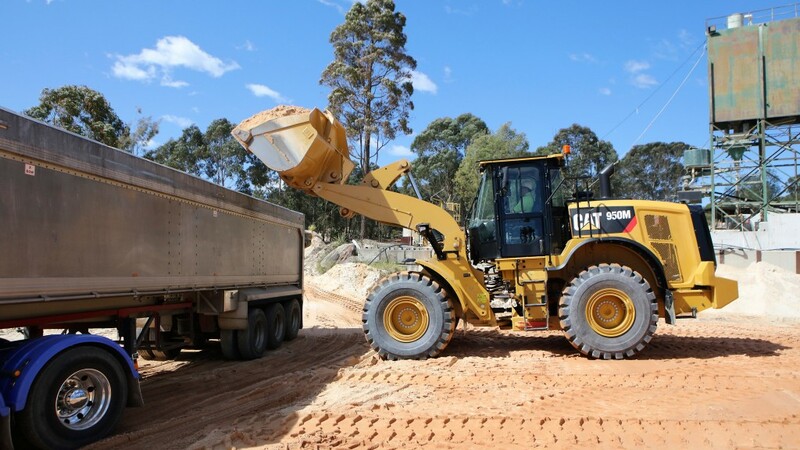 This service is provided at no cost to dealer for machines for machines with cellular Product Link, (standard on current 950 - 982 medium wheel loaders except the 950 GC), with remote-flash-compatible software. CWS authorization and mobile device required to initiate. New configurations in the medium wheel loader lineup include the 982M Forestry Machine and the 982M High Lift. The new 982M Forestry Machine (logger) is capable lifting 28,000 pounds (12,700 kg) with a pin-on mill yard grapple. Changes from the standard 982M include a larger tilt cylinder, upgraded rear frame, and heavier counterweight. Third party logging grapples and woodchip buckets are available. The 982M High Lift, compared with the standard lift version, increases dump clearance under the bucket pin from 15 feet 6 inches, to 16 feet 10 inches (4,743 to 5,143 mm). Configuration changes from the standard 982M include a new lift arm, new tilt cylinder, new tilt link, and the counterweight from the 982M Aggregate Handler. The Advansys ground-engaging-tool system included in the product update is a Cat tip system designed with exclusive performance features that result in less drag and higher productivity. The new tip shapes place wear-resistant material in the most vulnerable areas, resulting in significantly longer service life. A stronger adapter nose results in up to 50 percent less stress, and improved adapter-nose geometry reduces sliding wear on adapter surfaces. The improved tip shapes shadow the adapter straps and welds for longer adapter life. New 980M/982M buckets are released with weld on adapters; 950M - 982M bolt-on adapters are interchangeable with the former J and K Series. Among the package of updates for medium wheel loaders is a new universal coupler for models 966M - 972M. The new coupler eliminates width interference with multiple tools and a reduced offset increases breakout force by 4 percent. New LED and Halogen work and roading light packages increase safety when working in dark conditions. Handrail high visibility films enhance awareness of handrail locations and are available from Caterpillar dealerships. The 982M High Lift, compared with the standard lift version, increases dump clearance under the bucket pin from 15 feet 6 inches, to 16 feet 10 inches (4 743 to 5 143 mm).